State-wide campaign promoting good hygiene practice and vaccination to help prevent the spread of flu. Influenza or ‘flu’ is a viral illness that mainly affects the upper airways and lungs. It is not the same as a common cold and can lead to serious complications. In southern and central Queensland, most cases occur in the winter months whereas in the tropics flu can occur all year round. The flu is spread easily, mainly through sneezing and coughing. 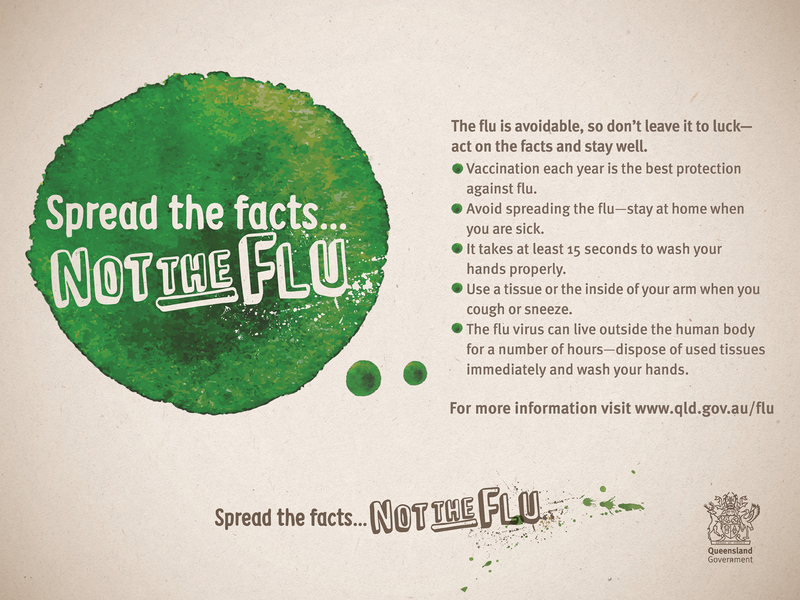 A person can spread the flu to others 1–2 days before they become unwell and can be infectious for up to a week. Research shows only 6 in 10 Queenslanders are aware that flu is preventable. Getting vaccinated each year is the best protection against the flu. washing your hands thoroughly with soap and water for 15 seconds. However the best way to protect yourself and others from the flu is to get vaccinated.